KENNEDY SPACE CENTER, Florida -- For more than 30 years, NASA's two Apollo-era crawler-transporters carried six space shuttles (Atlantis, Challenger, Columbia, Discovery, Endeavour and Enterprise) atop mobile launcher platforms from the Vehicle Assembly Building (VAB) to Launch Complex 39 at Kennedy Space Center. After traveling 2,190 miles, crawler-transporter 2 (CT-2), which weighs about six million pounds, will receive two new diesel engines and generators so it can be used to carry NASA's Space Launch System heavy-lift rocket, currently under design, and new Orion spacecraft to the launch pad. Mary Hanna, the project manager for the crawler-transporters in NASA's Ground Systems Development and Operations Program, is overseeing the upgrade efforts. "The crawler has to be ready for the new future programs," Hanna said. "It's the only way to get launch vehicles out to the pads, and we're taking time now to do the upgrades so that we're ready." On Feb. 15, in high bay 2 inside the VAB, NASA engineers and United Space Alliance engineers and technicians prepared the obsolete diesel engines, generators and associated parts for removal. The old engines, which were built in 1964 and installed as original equipment, ran the AC electrical system. Work began to remove the massive engines in late January when the crawler was moved from the crawler yard into the VAB. About 20 technicians and engineers coordinated efforts to remove the old engines and generators using the VAB's 325-ton overhead crane to lift them out. The new 1,500 kilowatt power diesel engines, built by Cummins Engines in Minnesota, arrived at Kennedy in mid-December and are being stored in the crawler maintenance yard. "The new engines are more powerful but they have a smaller footprint," Hanna said. After the engines are in place, Hanna said, there is a lot of work required to connect the electrical, plumbing and mechanical lines, and installation will be completed by mid-June. The removed engines are being drained, cleaned and readied for transport by flatbed truck to Ransom Road where they will be resold or recycled. Hanna said CT-2 also is undergoing other upgrades and modifications, including 16 new, higher capacity jacking cylinders; new roller bushings and roller shafts; upgraded electrical power system components; power, control and instrumentation cable replacement; and driver cab controls. Other upgrades include new electrical control systems and programmable logic controller modernization, new instrumentation systems, a new belt pin lubrication system, new hydraulic valves and hydraulic tubing replacement. Structural shear web augmentation and corrosion control are ongoing tasks, as well. 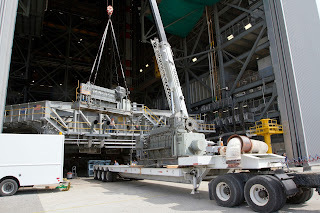 When all of the modifications have been completed, the crawler will be ready to carry NASA's heavy-lift rocket and other future space program vehicles to Launch Complex 39 for their turn to make space program history.